Jan. 9, 2019 — Blue Grass State politics are beginning to boil, all centered around the 2019 governor’s race. 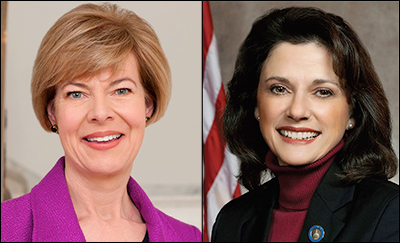 With the candidate filing deadline fast approaching on Jan. 29 for the May 21 statewide primary, several individuals are announcing that they will challenge unpopular Gov. Matt Bevin (R), including a Republican state legislator who is expected to make his formal declaration today. Though the governor has said he intends to seek a second term, and did so again a week before Christmas, the fact that he has yet to file a 2019 campaign committee has fueled speculation that he may decide to retire. Bevin was elected in 2015 with a relatively substantial 52.5 – 43.8 percent victory over then-Attorney General Jack Conway (D) after upsetting then-agriculture commissioner and now US congressman, James Comer (R-Tompkinsville), by just 83 votes in a May Republican primary that drew almost 215,000 voters. Bevin’s popularity ratings, however, have largely been upside-down throughout his tenure in office. According to the Morning Consult quarterly national gubernatorial approval rankings that were released just before the November elections in mid-October, Gov. 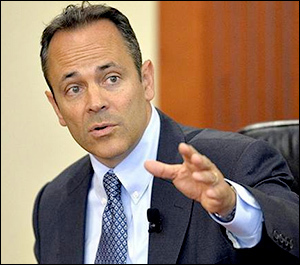 Bevin ranked 46th on the nationwide list, with a 30:55 percent positive to negative ratio. None of those finishing below the Kentucky governor on that particular scale in October remains in office. The least popular, according to the survey, Oklahoma Gov. Mary Fallin (R), was ineligible to seek a third term last November. Republican Kevin Stitt replaced her. Connecticut Gov. Dan Malloy (D) did not seek a third term and Democrat Ned Lamont held the office. Illinois Gov. Bruce Rauner (R) was defeated for re-election, and Alaska Independent Gov. Bill Walker withdrew before the election because his political situation was hopeless. Aug. 7, 2017 — West Virginia Gov. Jim Justice made national news the other night at President Trump’s rally in Huntington, WV, when the Democratic state chief executive took the stage to announce that he is switching to the Republican Party. The move now gives Republicans control of the entire West Virginia governmental apparatus, owning both houses of the state legislature and the governor’s office. 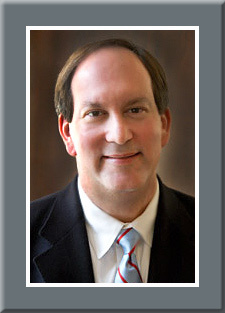 Factoring Justice’s party change, the GOP holds the West Virginia chief executive post for the first time since Gov. Arch Moore (R) was defeated for re-election in 1988. 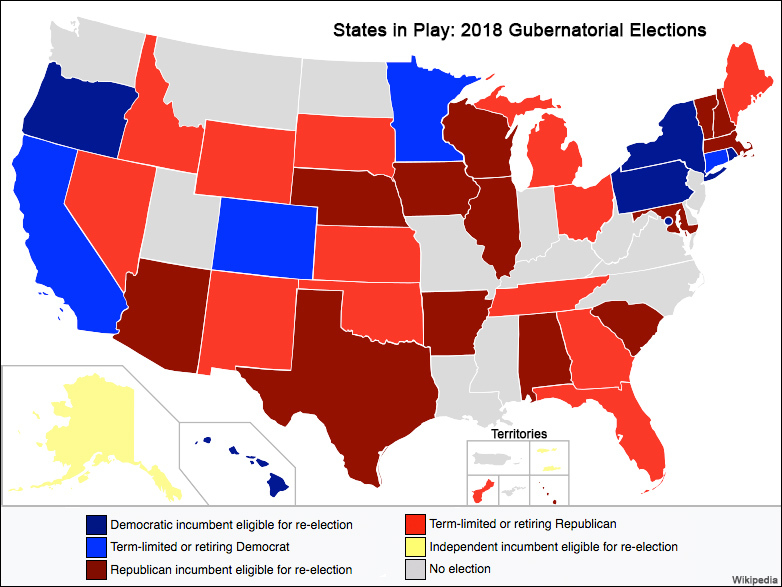 There are now 26 states where Republicans control the legislature and governor’s office, including Nebraska where the legislature only has one ostensibly non-partisan legislative chamber but is clearly overwhelmingly Republican. In contrast, Democrats have full power in only five states. The development means the Democrats drop to holding just 15 governors, an all-time low number for the party. Republicans, on the other hand, reach their historical apex with 34 governors as party members. The 50th governor, Bill Walker of Alaska, is an Independent. April 1, 2016 — A new Marquette Law School political poll (March 24-28; 1,405 registered Wisconsin voters, 471 “certain” Wisconsin Republican primary voters, 405 “certain” Wisconsin Democratic primary voters) reveals a major swing involving the Republican presidential candidates when compared to the organization’s previous survey taken one month earlier. With the Wisconsin primary being decided on Tuesday, the latest polls are being taken seriously. According to the just-released data, a net 31-point swing now puts Sen. Ted Cruz (R-TX) into a significant lead well beyond the margin of error. The late March Marquette results find Cruz leading Donald Trump and Ohio Gov. John Kasich, 40-30-21 percent, respectively. At the end of February, Trump held a 30-19-8 percent lead over Cruz and Kasich. 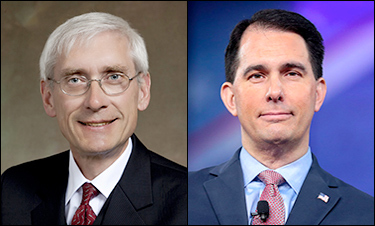 Wisconsin Republican Party leaders chose the Winner-Take-All by congressional district delegate apportionment system, meaning 24 of the state’s 42 delegates will be awarded to the candidate placing first in each of the eight congressional districts (three in each CD). Another 15 are awarded to the statewide winner, while the three Republican National Committee delegates also go to the top at-large vote-getter.